1973, Norman Hunter and Wembley weren’t the best of combinations. In May, Hunter was part of the Leeds United side that surprisingly lost to Sunderland in the FA Cup Final. In October, Hunter’s infamous error against Poland proved costly as England conceded the goal that ultimately stopped them qualifying for the World Cup. But on a happier note, in the previous home qualifier in January, Hunter had scored a screamer against Wales. The visit of the Welsh marked the first World Cup match at Wembley since the 1966 World Cup final. As on that famous day, England were managed by Sir Alf Ramsey and captained by Bobby Moore. But Alan Ball was the only other player from the 1966 final taking to the field, although the side did contain Norman Hunter who had been an unused squad member in that triumph and made one substitute appearance at the 1970 tournament. This was realistically going to be the defender’s last chance to properly figure at a World Cup. With England having started the campaign by beating Wales in Cardiff two months earlier, there seemed little cause for concern ahead of this rare January international. 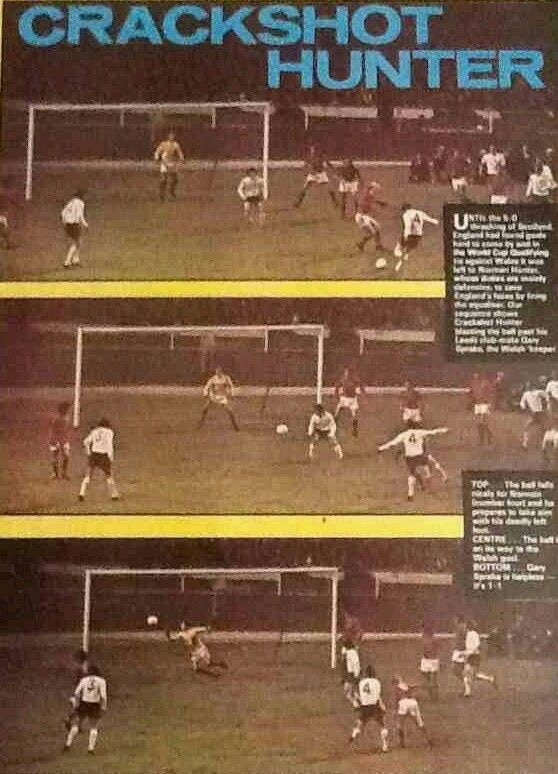 All that changed after 23 minutes, John Toshack scoring from close range to give Wales the lead. 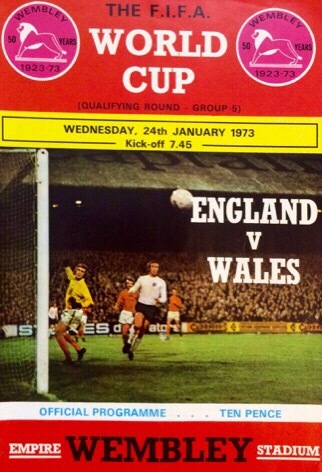 Suddenly it didn’t look so certain that England would be at the finals in West Germany. They now began to attack with vigour, but – in an ominous warning sign for what would later lie ahead with Poland and Jan Tomaszewski- they came up against a goalkeeper in good form in Gary Sprake. But the one man who would beat him shortly before the break was Hunter, his Leeds United colleague. Hunter was involved in bringing the ball forward as England attacked in numbers. Colin Bell drove the ball into the box, with it being deflected away into the path of Hunter. He struck the ball goalwards with venom from outside the box, his left foot drive flying into the roof of Sprake’s net. “Sprake knows all about Norman Hunter but he knew nothing about that,” proclaimed BBC commentator David Coleman as Wembley erupted with delight. It had been a goal to savour. “Oh, how England need forwards who can shoot like that,” reflected Geoffrey Green in The Times. Norman Giller in the Daily Express wrote of a goal that was “fashioned out of nothing”. In the Daily Mirror, Frank McGhee said: “It is in a way a tribute to England’s equaliser in the 40th minute that a ‘keeper in Sprake’s superb form was left frozen in disbelief at the ferocity and power of the Norman Hunter shot that flew past him from 25 yards.” Green also called it at 25 yards, Giller gave a more conservative estimate of 20. Wales’ Leighton James, in an interview in 2004, recalled it as being 30. But regardless of just how far out it was, there was no getting away from the fact that Hunter’s goal had caught the eye. “You did not see him often over the halfway line. It showed how much pressure they put on us,” recalled James. Hunter would generally be known for his ‘bites yer’ legs’ reputation rather than his goalscoring ability, scoring just 22 times in 679 Football League appearances. For England he was hardly prolific either, the only other goal he scored in 28 caps coming against Spain in 1968. But against Wales he drove in a goal to remember. It sadly wasn’t what most people would be talking about the following day, England having to settle for a 1-1 draw and being booed off the pitch. It wouldn’t be what most primarily remembered his England career for either, the mistake against Poland nine months later sadly – and perhaps unfairly – sticking in many minds far more. But Hunter’s goal against Wales had been one to treasure, a prime candidate for any list of forgotten great England goals – a left-footed drive from distance that flew past Sprake. It was a Bobby Charlton-esque goal from the most unlikely of sources.